To tell the WHOLE story I have to start from the day before.. We arrived at the Hilton for the race expo mid-day, parking was a zoo and the expo was CROWDED! I could barely fit through the tight halls and vendors. I fell in love with a cotton Nike Dry-fit Eugene Marathon top, passed it then later came back and bought it, good thing because they were sold out on race day and only taking cash. The long sleeve race t-shirt is AWESOME although with my long arms and waist I rarely fit in the free shirts. We left the Hilton to check in the hotel and drive the race course. My eyes were watering and nose was itchy, the amazing spring flowering trees were giving me an allergic reaction, I thought about getting some medicine, but let it go and hoped for the best. Our hotel was less than 3 blocks from the race start...SCORE!! Much of the course is on a bike path so we did the best we could to drive from start to finish. Eventually we got to a stopping point and went to buy a Eugene Map so Muscle Man could create his spectator plan. Then it was time for dinner. I usually ate Spaghetti the night before long runs and did not want to deter. When we saw the "Marathon Discount" at a classy place near our hotel we stopped in. I had an AMAZING meal of chicken, rice and fresh veggies, paired with a salad and water... YUMMERS!! And I had a little take home box for later. We shopped for food and supplies then drove to scope out morning and post race parking. We settled in our room. I got my gear ready and went to SLEEP! I fell to sleep quickly, still not nervous at all. At 3:30am I had a NIGHTMARE that I missed the race and could not fall back to sleep before the 5:45am wake up call. WAKE UP!! Got ready quickly and had a pit stop before leaving the hotel. I spread the peanut butter on my bagel with my finger (forgot the knife lol!) I had a hard time eating the bagel, took me about 20 minutes to eat it.. WEIRD! I had pre-stuffed my handheld water bottle and race belt with Gu's, Chomps and Saltstick tabs. The crowd was thick. I wanted to maintain a slower pace but my legs wanted to go FAST. Nothing too crazy but I did gain 30 seconds. I told myself that I would pay attention to the time I was banking and use it in later miles if I felt I needed to slow. I had a pace band but my plan was to run off of feel. An OLD Man passed me wearing brightly colored shorts with geometric design, a matching orange top and matching orange and blue shoes, it made me smile. I would smile a lot during the Marathon. During the first mile I saw a sign that said "Believe Mel" may not have been for me, but I will take it. Cruising along with a fresh mind I formed my race nutrition and hydration plan. Mile 3 already and there was hubby, I cheesed for a photo, feet light as I glided past. A man introduced himself "I am Will and I will be in your photo forever" So funny, I love runners. The miles blended together as I enjoyed people watching and scenery. I paid close attention to my Garmin pace and the road. My plan was to stay on the level part of the road avoiding sloped areas that can cause pain in the legs. Many people were chatting happily, I would have enjoyed some company, but I knew I needed to conserve my energy. Mile 6 there was hubby again with the camera. So amazing to see his smiling face. Soon after I also spotted Alisa, she did not see me so I yelled her name, think I startled her because she dropped her sign. I wonder what the sign said?? I waved and cruised on, I would see her a few more times during the race, always nice to see a familiar (well via Blog) face during a race. Mile 8 was the big HILL, it was steep but not too long. I thought about the Mercer island Half Marathon and my 23.3 mile training run in Point Defiance, this was CAKE! Mental images of my training kept my mind sharp and my belief strong. Headed down there was Muscle Man again. I knew that he would be at mile 13 with my fuel belt, the plan was to swap the handheld for the fuel belt leaving my hands free for the second half. I followed the crowd into a BEAUTIFUL park. One thing I must say about the Eugene course is that it is very scenic, there is one section from 10-12ish that is GROSS and industrial, but it does not last long. 14ish I high fived 2 little girls and later a few more kiddos, I thought about our little studs. I jockeyed back and forth with 3 women who seemed to be in my age group. A girl in all white with a bushy bouncy ponytail, a slim redhead, and a short haired tiny-pocket runner in black. Saw Muscle Man at mile 17 and was starting to FADE, so I took a Gu early and kept on. The photos from mile 17 are too HORRID, but you know me I will show you anyhow LOL! Along the was there were lots of GREAT people playing instruments, blasting music from their cars, spectating from their front lawns and cheering loudly, the crowd support was perfect. One lady had a small circular water bottle with no label...hmmmmm she was offering it to runners, I opted to pass on that one. WEIRD!! The weather was ideal, no wind, clowd cover and just under 60's. When the sun came out I was happy to be wearing my pink hat. I LOVE LOVE LOVE being in the woods, park, hiking, etc. Much of the course felt like a nice run across beautiful landscape. I could feel myself smiling for no reason, people probably though I was crazy. I spotted many many runners along the course in Boston gear, I smiled because I knew that I would be there. I had 4 spectators who would yell "Go Tall Mom" and "There is Tall Mom Again" every time I passed, made me smile. A VERY HAIRY man in a trench coat was stumbling along the path, not sure where he was headed but he was CLEARLY intoxicated at 10am. I saw Alisa with a sign that said something about "Walls have doors, smash through" and I yelled "What Wall?" She said "You look great!" and I felt it.. In the Park there was a fence with 3 hearts shaped out of vines, VERY COOL! Miles 22-26.2 were the SLOWEST miles ever. I had not hit the wall, but I struggled to keep my pace up. I was glad that I had banked time. A woman passed me and said "You look strong," as she zoomed by, she must have saved her speed. The path was green and weaved through parks. Thin athletic looking men were dropping left and right, massaging calf cramps and stretching quads, made me sad for them and VERY BLESSED that my legs continued strong. I planned to kick up the pace the last 3.1 so I did. I started picking off people, including bushy ponytail girl who had been 100-200 yard ahead of me the whole race. I never looked back during the race, not sure why, guess I was afraid the 3:40 pacer would catch me :) I saw a young woman in a Boston jacket at mile 23ish and said "I will be there next year," she smiled and yelled "Congrats you are doing GREAT!" My math skills were done, I could barely keep my eyes open, my mental capacity was nearly maxed, there was a tall woman in blue ahead, I focused on her and kept my arms moving. I passed a few men and hoped to see Hayward field, it was so far away and my legs were done...it was mental!! I was tired of being so focused, tired of shaking out my arms, Gu-ing on specific intervals and making sure to keep steady breathing and pace. My mind was more tired than my body. As I entered the field I thought about Zoe and her kick to the Finish Line, I knew she would be PROUD if I chicked a few guys, so I did :) There were timing mats, a photographer and a Jumbotron, I put my arms up and flexed, the crowd cheered.. I know it was a little boastful, but it was for my Muscle Man, it was my pose of strength. And I had just run 26.2 miles and qualified for Boston!!!!! I hope the pictures turned out good. Then I realized hmmm it was not the finish...UGH!! I probably could have gotten a sub 3:37 if I would have run strait through, Oh well. DONE. STOP. I DID IT!!!!! The most beautiful and huge medal was draped around my neck as I hobbled to remove my timing chip. I smiled and yelled, I was so excited I could not contain my joy!! Grabbed a few things from the post-race grub, said a quick hello to Tiffany from Dailymile, got my official results and found Muscle Man. Recovery socks, chocolate milk, fishy crackers and a seat to watch others finish. Hubby texted a few family and friends, I had left my phone in the car, not realizing that the website tracking was not working.. UGH! I was so happy, felt so blessed, knew that everything had aligned and my training had paid off. This week I will have a few posts dedicated to Eugene, Photos, Stats, Lessons learned, and Thanks You's. We will be moving also, so bear with me as I am STILL absent from commenting. Signing off Tall Mom Mel the Boston Qualifier!!! 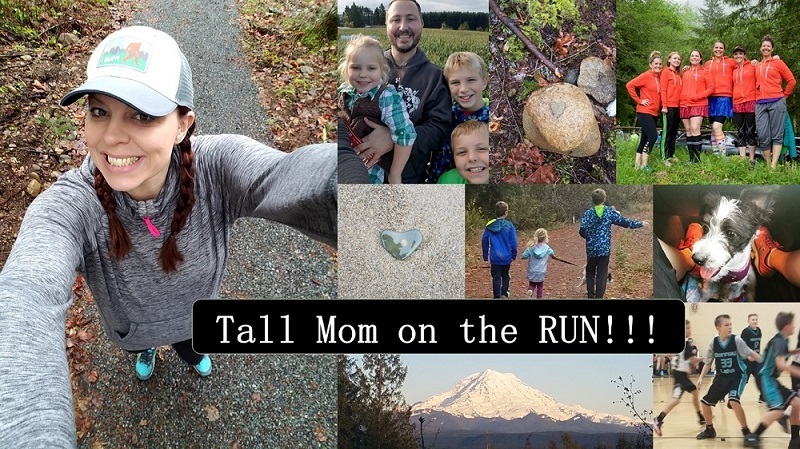 For those of you participating in the Tall Mom 5K on 5/5 please bear with me, I am TRYING to pull it together..
Congratulations on the boston qualifier! How exciting! Hopefully I'll feel that excitement someday! Awesome recap! I got all choked up reading it. So proud of you Mel! Congrats on all your hard work and your amazing accomplishment! Hugs! so fun reading people's BQ reports. so happy for you...it's the best feeling, isn't it. make sure you tell everyone about it!! congrats! Great job, Mel! I knew you could do it. Way to run strong! Hope the move goes smoothly for you guys this week. Awesome!!!! I so enjoyed reading your race report. It made me even more excited to start training for my first marathon!!!! Thank you for the inspiration! I forgot about the 5K on the 5th. I'm not sure if I signed up or not. Facebook the details if you get a minute please so I can make sure I'm all signed up. YAYAY!! What a great race. So happy for you and your big ol' BQ. That's awesome. Cannot wait to see pictures! studying for finals, so I don't have much time - but you're awesome, and I loved the recap! And I'm SO PROUD OUF YOU!!! Be a little boastful, you earned the right! Great recap, so happy for you! you rock girl. Congrats. Wish i could say the same about my run yesterday. ugh. Awesome job! Your report reminded me so much of my PR effort last fall. Mile 17 was my first rough spot in the race, like yours. From there on I just rode out the rough spots and picked it up whenever I felt strong. And the fuzzy head thing at 25? So get that! Congrats!!!! So happy for you Mel! GREAT race report and what a story. You smashed your record and smiled while doing it. Congrats to you and fingers crossed that I might, just might??? see you in Boston. Congratulations, Mel! Wonderful recap! Can't wait to see the photos. Great recap! Congrats again on the BQ! You had an amazing race, well done! Love the race report, Mel! So proud of you...and totally inspired! Congratulations on being a STRONG as well as Tall Mom!! Great job!! The "Believe" sign was for you. I went back and forth between Mel and Tall Mom then opted for Mel so that the letters could be bigger. I'm so glad you saw it. Great job, Mel! You trained well and had a textbook race. Hats off to you! Enjoy the feeling! Wow Mel! What a fantastic race report!! Thats the kind that get me choked up! So happy for you :) Looking forward to your photos and that training plan you are going to post **wink **wink!! Had to tell you I thought of you when I got my race number this weekend...123. I added the 1+2 which of course is 3, plus an extra 3....you can see why I thought of you! I've been waiting for this! Excellent report. Your strength, determination and focus paid off and I will be remembering this on my day. How many gels/chomps did you end up taking? Just wanted to call you out on what you wore! You didn't pick any of the outfits pictured as our choices. I really thought you would go with #4 and was looking for the pink capris and printed running skirt. So what's up with that? Also, did you hear the announcer call out your first and last name? He even commented on your pink hat...most people just go their first names announced. Amazing!! I felt that joyful my first race, but I was a snail at 4:15 compared to you, i hope to reclaim that feeling in Seattle. You deserved this race and clearly we are all excited for you! great race recap!!!! great job! u r awesome! Awesome! SO happy for you! Loved reading your recap! Congratulations!! Awesome race report! Looking forward to the pix! great recap!! i am so excited for you right now. i am doing my first marathon in November and I hope that i can be focused and have a plan. you are INCREDIBLE and INSPIRING:) Congratulations!!! Loved your report. Your positive attitude and happiness shone through! You are an inspiration. Congrats!!! I was thinking about you yesterday and hoping you had your BQ! Way to go girly!! Redemption is yours!!! Congratulations!! What an awesome race you ran...loved your report! Awesome job! Great report, and I know I already told you this, but so proud of you!!! you made chills run down my spine!! So proud of you Mel! You are a true inspiration to so many, and you should be so proud of yourself!! Way to go....now I just have to wait a whole year to hear the Boston RE-cap!!!! Good luck with the move! Your a super-star! Congrats on the BQ!!! Awesome! nice nice job! what a feeling! ride the high baby!!! Just like you knew it would happen. I don't think your BQ could have been any better. Not so easy that you weren't challenged and not difficult enough to keep you from it! The best victories are the ones you work for and Mel you earned this one! Great training, great support, great race. You've shown others how to do it! Congratulations! The race sounds wonderful. I went to college in Eugene and can't wait to run it someday. I hope you are still on your BQ high. Enjoy it!! Awesome...you are a machine! I will need all of your advice and wisdom on how to train and run a marathon..My first will be in October! AMAZING job Mel!!! you had such a GREAT race, stuck to your plan, and smiled the whole way... amazing job :) congrats on the BQ!!!! You seriously looked so strong and fast all three times I saw you. "I put my arms up and flexed"
Love it. Nothing says it better. Congrats Mel. It was an amazing review. I am so proud of you!!! What an amazing race! Congrats to you, Tall Mom Mel-Boston Qualifier! Your story is making me tear up! thinking about all you've done to get ready for these few hours, all you have to look forward to and all you've accomplished! It also makes me remember what it felt to cross the finish line last November (although at a much slower pace). Congratulations!! Can't wait to read your Boston recap next year! Congrats! Getting that BQ makes all of the training worth it! Great job Mel! Congrats on the BQ!! Awesome job! Great race recap! So awesome that you had such a great experience all around! Love that you were able to chick some dudes! Sounds like your feul system worked really well! Excellent recap! Im so happy for you! Woo Im pumped to train for a marathon now!!! Awesome race report! I'm looking forward to the pictures! I'm soooo late but congratulations! So happy for you! Headed to read the post with the pictures now!